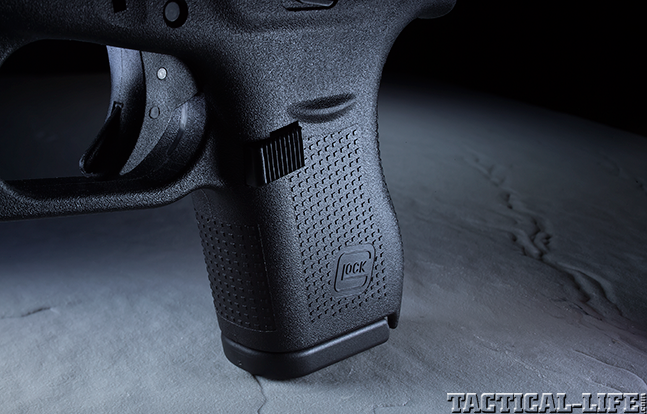 The Glock 42 is a next-gen deep-cover pistol that offers 6+1 rounds of backup firepower! 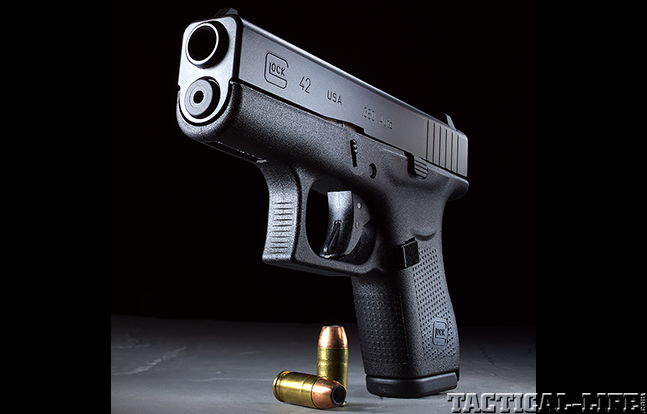 The new G42 is extremely compact yet carries plenty of lifesaving .380 ACP backup firepower as well as Glock’s renowned simplicity and reliability. During testing, the Glock 42 pistol ejected every spent casing reliably, thanks in part to its external extractor. The G42 has a short trigger reach and, like all Glock pistols, has the trigger safety toggle that prevents accidental discharges. 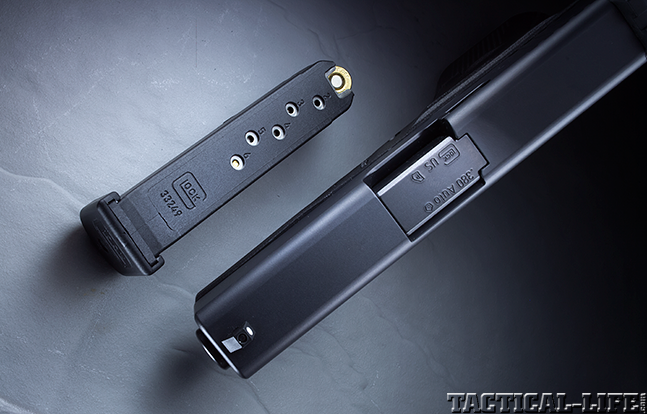 G42 magazines, which hold six .380 ACP rounds, have witness holes so you can easily see how much ammo you have left. With a width of 0.94 inches, a height of 4.13 inches and an overall length of 5.94 inches, the Glock 42 is very easy to conceal. 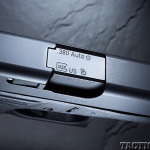 When it comes to LEO duty pistols, Glock is a trusted and proven brand. And, with the introduction of the .380 Glock 42, cops have a great deep-cover or backup gun option that works just like their primary duty gun. The subcompact Glock 42 in .380 ACP was officially introduced in January 2014, but I was able to get an early sample for testing in late 2013. Only 0.94 inches thick, 4.13 inches high and 5.94 inches long, this will pistol lie flat against your body in a pocket or vest holster without bulging through your uniform. Weighing only 13.76 ounces unloaded, its feathery heft will be appreciated by a uniformed officer overburdened with duty gear, and the lightly dressed off-duty cop in hot weather alike. The Glock 42 has an extremely short trigger reach, which will also endear it to petite female officers and male officers with short fingers. Its cartridge capacity is six .380 rounds in the magazine, and a seventh carried safely in the firing chamber of its 3.25-inch barrel. The pistol’s overall size is roughly comparable to the S&W Shield and Springfield XD-S, but it’s distinctly lighter and thinner with much less recoil. 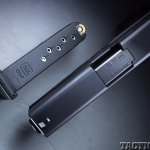 Though the internals are slightly different to allow for a drastically reduced size, the mechanism and trigger pull are essentially “all Glock,” a system which has proven itself to be extremely “shootable” under stress for more than a quarter century. 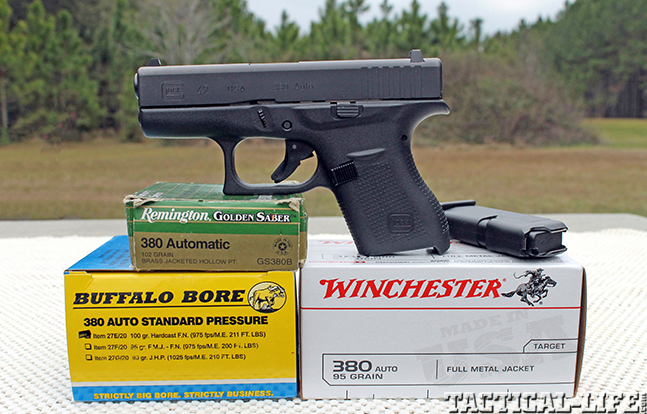 It is much easier to learn to shoot well than most micro .380 pistols, which tend to recoil rather sharply and have relatively long, heavy trigger pulls for every shot. 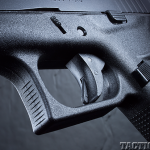 Factory specified for a 5.5-pound trigger pull (generally measured from the toe of the trigger), my test G42’s trigger had a 7-pound pull weight when measured from the center of the trigger, where the finger normally lies. However, because the short trigger reach lets shooters get more finger on the trigger, it felt like 5 or 6 pounds. The pull was smooth and the break was clean, without noticeable backlash. 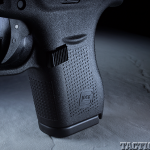 For targeting, the pistol has a standard Glock white-outlined, square-notch rear sight and a white-dot front sight. Both were easy enough to see and align. There is a long history of small “pocket guns” being difficult to shoot accurately at distance. This is due to their short sight radius, their very light weight in relation to relatively heavy trigger pulls and small grip frames that don’t allow for a full hand grasp. 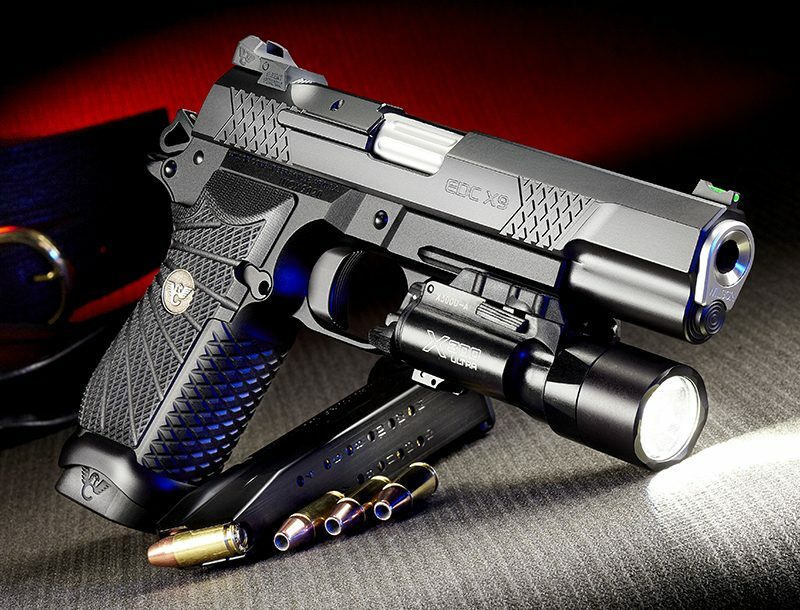 Accordingly, it is customary to test very small handguns like these at no more than 15 yards, or as little as 7 yards. However, there are no bad guys who’ve been across a parking lot shooting at an off-duty cop who said to each other, “Gosh, Spike, that poor off-duty cop we’re shooting at only has a little gun, so let’s be fair to him and level the playing field. 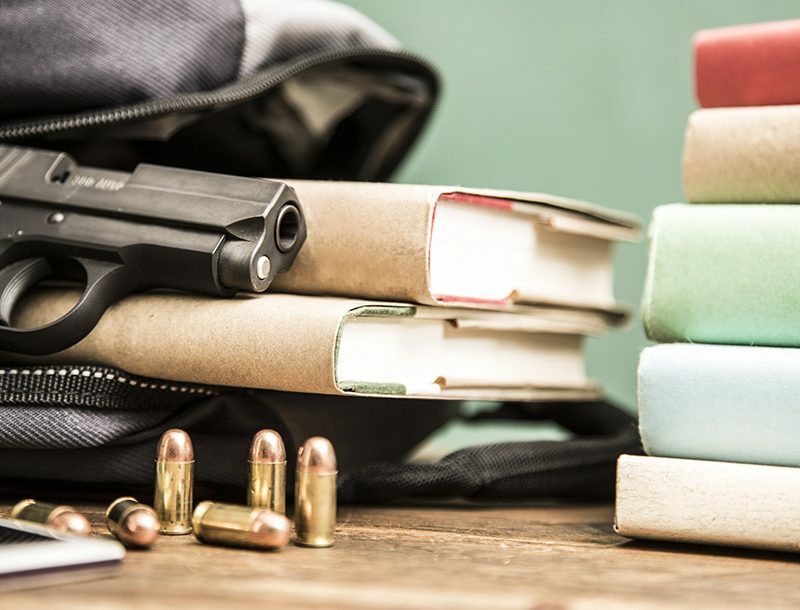 Let’s get closer to him, so he can shoot us easier.” Accordingly, I make a point of testing off-duty and backup guns at the same distance now included in most service pistol qualifications: 25 yards. Initial testing showed the bullets grouping slightly left of the point of aim at 25 yards, but some quick work with a universal sight-pushing tool brought the point of impact center and square with the point of aim. Winchester’s affordable, 95-grain, full-metal-jacket (FMJ) “White Box” ammo is a practice load for .380s, but some believe that FMJs are the best choice for a defensive .380 because they guarantee sufficient penetration. This load put all five shots in 3.6 inches at 25 yards, and the best three into 1.6 inches. For perspective, a group size of 4 inches at 25 yards is widely touted as acceptable service pistol accuracy for a full-sized duty gun. However, the round my test G42 liked best was the heaviest .380 hollow point out there, the Remington 102-grain Golden Saber. Five shots went into 3.55 inches at 25 yards, with four of them in 1.45 inches and the best three in 1.2 inches. 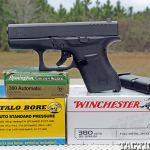 By the time I got to 7- and 15-yard accuracy testing, having run hundreds of scarce .380 rounds through the G42 to test its reliability and competed in two matches with it, I was almost out of .380 ammunition. With some 95-grain PMC FMJ ammunition at 7 yards, firing at PPC competition pace with a two-handed, standing Isosceles stance, the traditional five-shot group measured 1.15 inches, with four shots just about touching in a 0.55-inch cluster. Clearly, the G42 is one accurate .380 ACP. Glock Sport Shooting Foundation (GSSF)pistol matches are hugely popular all around the U.S., and they draw many cops. In February of 2014, I had the chance to compete with the G42 in the first two such matches with the new “Pocket Glock” category, in Orlando, Fla., and Griffin, Ga. Shooting from a standing, off-hand position and against the clock, I found the short trigger reach could be a problem. Starting with my finger out of the triggerguard (as required) and coming up from a low-ready position, I found that if I contacted the trigger with the pad of my trigger finger, I pulled left. I quickly learned to center my finger’s distal joint on the trigger, as if shooting a double-action revolver. The shots returned to the center, but not before I had left one steel plate standing in Orlando. Otherwise, the G42 sent the bullets where I held the sights, and I finished in the top five at both Pocket Glock events. At the Griffin match, my time was within a second of my score with the Glock I seem to shoot best, the subcompact, .45 caliber G30, in what the GSSF calls the “Major Sub” category. With one shot per target, the course of fire is identical between Pocket Glock and Major Sub. This told me that the G42 is one “shootable” little .380! 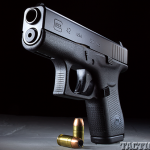 Light and flat, the Glock 42 disappeared under my shirt in a Galco inside-the-waistband holster clipped to the top strap of a Second Chance ballistic vest in a shoulder-holster-like position. 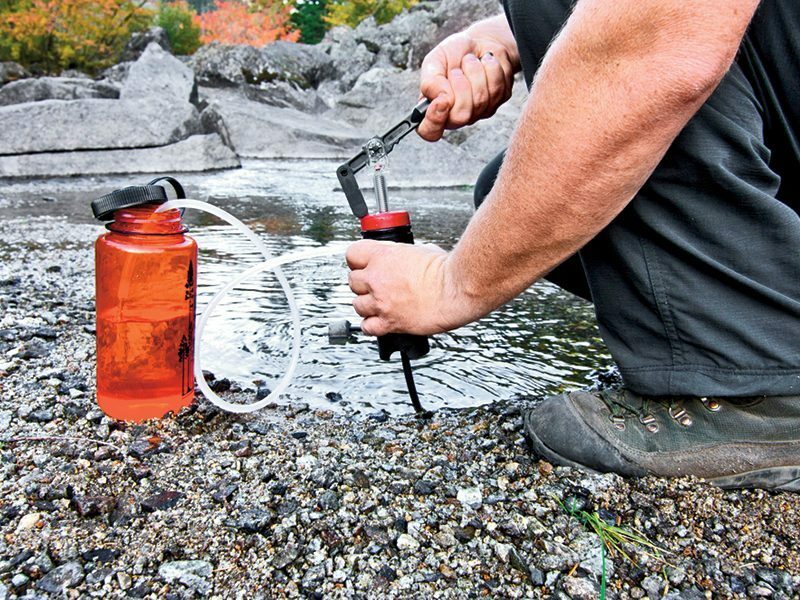 It also carried very comfortably in a Galco pocket holster in the left-side pocket of some lightweight cargo pants. 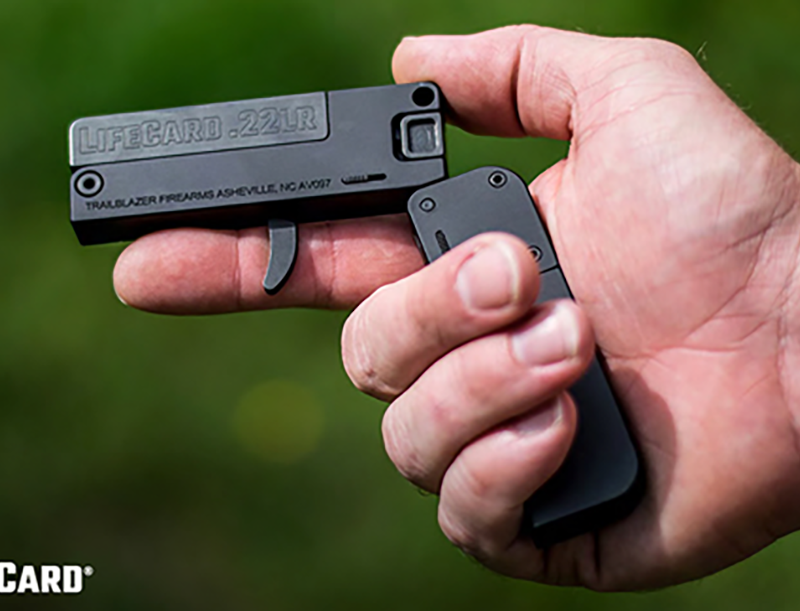 In one department that has made the G42 an optionally issued backup, along with snubnose revolvers and subcompact 9mms and .40s already in inventory, the comfort factor of the G42 is already skyrocketing it to the position of being the favorite backup in that department. I ran hundreds of rounds through the G42 in testing with zero malfunctions. The only two malfunctions I later experienced were (naturally!) in the Glock matches, one with Winchester flat-nose ball ammo in Orlando and the other with a Speer Lawman round-nose FMJ in Griffin. Both were premature lock-opens of the slide, and each was cured by simply thumbing down the slide-stop lever. One may have been caused by the median joint of my right thumb hitting the slide stop during the firing cycle. 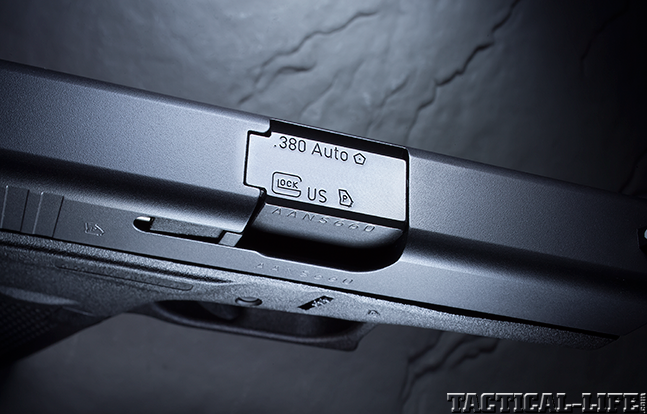 The .380 ACP has never been considered powerful enough in this country to be an on-duty uniform service pistol. 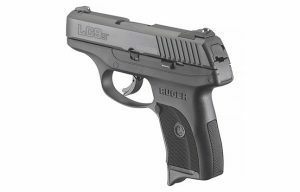 However, when concealability took priority over power, .380s have been issued as primary handguns to undercover agents, authorized for detectives and supervisors, and issued as backups by various prestigious agencies. The big complaint I’ve heard about the G42 from brother officers in person and on the internet is, “It isn’t chambered for the 9mm!” If that’s your concern, I can only say, “Wait a while.” If that’s not a concern and you’re comfortable with the .380’s power level, you know why cops are ordering Glock 42s for backup and off-duty carry in droves. We all know that with handgun ammo in general and less-powerful rounds in particular, it takes precise shot placement to end a lethal fight. 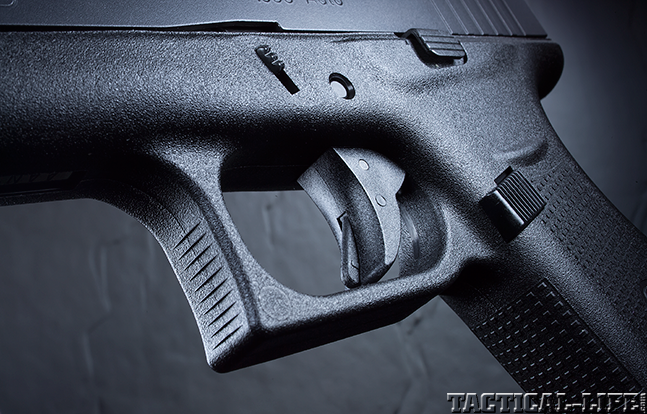 The G42 is one .380 whose design lends itself to such precise shot placement. Gun dealers serving law enforcement agencies tell me that they’re already hugely back-ordered on individual officers’ purchases of Glock 42s. Clearly, the police community is voting with its feet and its wallets in favor of these neat little .380s.